Hamad International Airport is your gateway into the glittering heart of Qatar. It replaced Doha International Airport in 2014 as Qatar’s principal airport and has since become one of the busiest airports in the world. Hamad International Airport boasts a unique terminal that is divided into five concourses. The airport offers flights to a number of destinations around the world. Hamad International Airport (IATA code: DOH) is a key airport for international arrivals and departures and the hub airport for the national carrier, Qatar Airways. Flights to Hamad International Airport are provided by international airlines such as British Airways, Emirates, and Turkish Airlines. DOH is a 20-minute drive from central Doha. Book your cheap flights to and from Hamad International Airport online! Hamad International Airport is a world-class airport that offers a futuristic doorway to one of the most dynamic cities in the Persian Gulf. The airport made its debut in 2014 and has become one of the best airports in the world – it was awarded the prestigious ‘5-Star Airport’ designation by Skytrax in 2017. Currently, Hamad International Airport boasts one terminal with five concourses serving both domestic arrivals and departures and international arrivals and departures. A second terminal is in the pipeline. Two runways ensure the airport is able to accommodate the many flights that arrive at and depart from Doha, while its exceptional services and facilities ensure a smooth and effortless travel experience for the millions of passengers that pass through its doors annually. Dining at Hamad International Airport is a gourmet affair that showcases the best of international cuisine. From classic American burgers and Italian pasta to French fare and Indian delicacies, there is something for every kind of palate. The Hamad International Airport shops offer a paradise for shopaholics and those in need of some retail therapy before embarking on their journey. The shops offer everything from electronics, toys, jewellery, and fashion, to books, music, and travel essentials. Qatar Duty Free offers a range of products, including perfumes, cosmetics, skincare, confectionary, liquor, and tobacco. Be sure to take note of baggage restrictions and duty-free allowances at your destination. Services at Hamad International Airport include: foreign exchange, baggage wrapping, hotel desks, meet and greet, car hire, and special assistance. 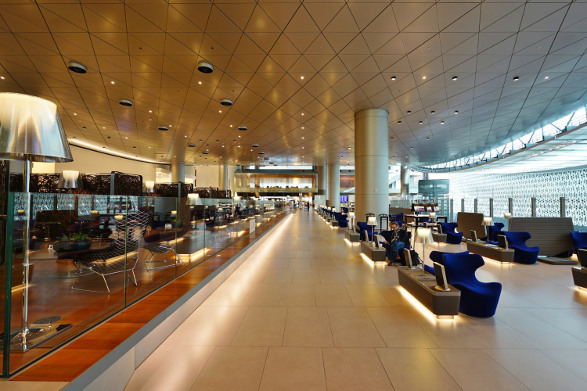 The Hamad International Airport departures area and main building offer several lounges for arriving and departing passengers. A Special Assistance Travellers’ Lounge and Unaccompanied Minors Lounge are also available. Hamad International Airport offers a huge selection of facilities. These include: ATMs, prayer rooms, wellbeing & fitness centre, smoking rooms, WiFi, internet kiosks, telephone booths, parenting rooms, kids play area, family toilets, and a medical centre. This elegant 3.5-star hotel is an easy 15-minute from Hamad International Airport and 7 minutes from the city centre of Doha. Some of the amenities include a health club, restaurant and bar, conference centre, air conditioning, daily housekeeping, on-site car rentals, and spa services. Free WiFi and parking is included. Conveniently located at Hamad International Airport, this 3.5-star hotel is perfect for long layovers, short stays, or business trips. Amenities include a full-service spa, 24-hour health club, air conditioning, daily housekeeping, porter service, restaurants, and indoor swimming pool. Free Wi-Fi is available. This luxurious 5-star beachfront hotel is situated just 11 minutes from Hamad International Airport. Some of the amenities include a private beach, swimming pool, nightclub, health club, conference centre, full-service spa, restaurants, and a marina. Complimentary Wi-Fi, parking, and airport shuttle bus is included. Foreign currency can be purchased at a foreign exchange bureau up to 60 days before departure from South Africa. You can also buy foreign exchange at the airport when you arrive. Note: purchasing foreign currency at the airport may incur hefty surcharges. Foreign exchange kiosks can be found in the arrivals hall, arrivals baggage claim area, departures area near Concourse B, and in the departures check-in area at Hamad International Airport. Hamad International Airport offers covered short-term and long-term parking options. Designated parking for people with disabilities is also available. A complimentary shuttle bus service runs between the terminal and parking areas every 15 – 20 minutes. Cash payments are accepted at the payment machines on each car park level. Card payments can be made at payment desks on level one in the east and west car park areas. Hamad International Airport is located approximately 9 km southeast of central Doha. Several transport options are available to get you from the airport to your destination, including car hire, taxi, bus, and limousines.